A man who interrupted an auto burglary in Gilroy early Friday was shot in the leg, prompting an hours-long standoff between and police and who they considered at the time persons of interest. Suspicious people near Hyde Park and Victoria drives were reported to police around 2:55 a.m. The caller was worried because of a recent rash of burglaries in the area, police said. While traveling to the scene, officers learned that shots had been fired and a man had been wounded. His injuries were non-life threatening, according to police. The man told police that he confronted two alleged car burglars when a third allegedly said, "I'll show you what I'm doing!" before shooting at him several times. A bullet hit the victim's leg, police said. The group of suspects fled the area, but officers were able to arrest one of them. Investigators quickly found that the three remaining suspects were hiding in one of their homes on Ervin Court. 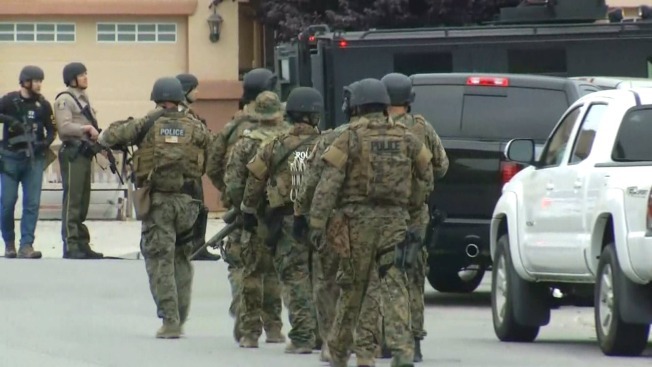 Police and SWAT teams from Gilroy and Morgna Hill swarmed the neighborhood and surrounded the house for several hours. Video from the scene showed police speaking over a PA system, ordering the trio to surrender peacefully. Officers detained two people at the house, police said. It remains unclear how the standoff de-escalated. Detectives then found the third person of interest walking on nearby Princevalle Street. Police on Thursday said it has been determined the residents and people associated to the home were not involved in the crime. "There were certain facts that gave us probably cause to believe that the residence was related to at least one of the suspects," Sgt. Jason Smith said. "The police department has been in contact with the residents and our reasoning has been explained in great detail." People with information about the case are asked to call Gilroy police at 408-846-0350. NBC Bay Area's Bob Redell contributed to this report.